Dr. Robert G. Dernick DDS invites the residents of The Woodlands, Spring, Conroe, and the surrounding areas in TX to enjoy exceptional dental care with a personal touch. Dr. Dernick’s passion for dentistry began as a child and continues to this day. He completes countless hours of continuing education to remain at the forefront of the latest advances in dentistry so that he can continue to provide his patients with the very best that dentistry has to offer. 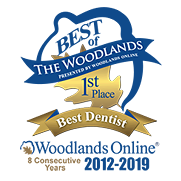 Dr. Dernick is not your average dentist in The Woodlands, TX; he has standards of excellence in patient care that he will not compromise. He is committed to helping patients improve their quality of life with optimal oral health and beautiful smiles. The doctor is warm, caring, compassionate, considerate, honest, and very experienced, which are exactly the qualities you want in the person who will be your long-term oral health care partner. With our comprehensive range of services, most of our patients’ dental needs can be addressed right here in our office. On the rare occasion that we must refer one of our patients to a specialist, we have trusted associates here in the same group and office with whom we work closely. We are a family dentistry and welcome patients of all ages from children to seniors enjoying their golden years. We believe it is never too early, or too late, to enjoy optimal oral health and a beautiful smile. We love what we can do for our patients, and seeing their delighted smiles is what makes each one of us love coming to work every day. When Experience Counts, you can count on Dr. Dernick. He provides a level of excellence that cannot be learned in dental school, it comes from a passion for his art, a love for his patients, and many years of creating beautiful, healthy smiles. Call 281-363-2770 and schedule an appointment today.